Before the current mayhem Rob came up one night last week for a game set during the Franco-Prussian war. 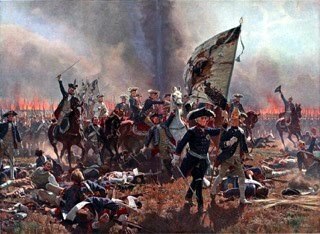 The French had to hold off a Prussian advance long enough to get their forces across the river, while the Prussians had to stop them. The one fly (or one of many flies) in the ointment for the French was a brigade of Prussian infantry blocking the French escape route. 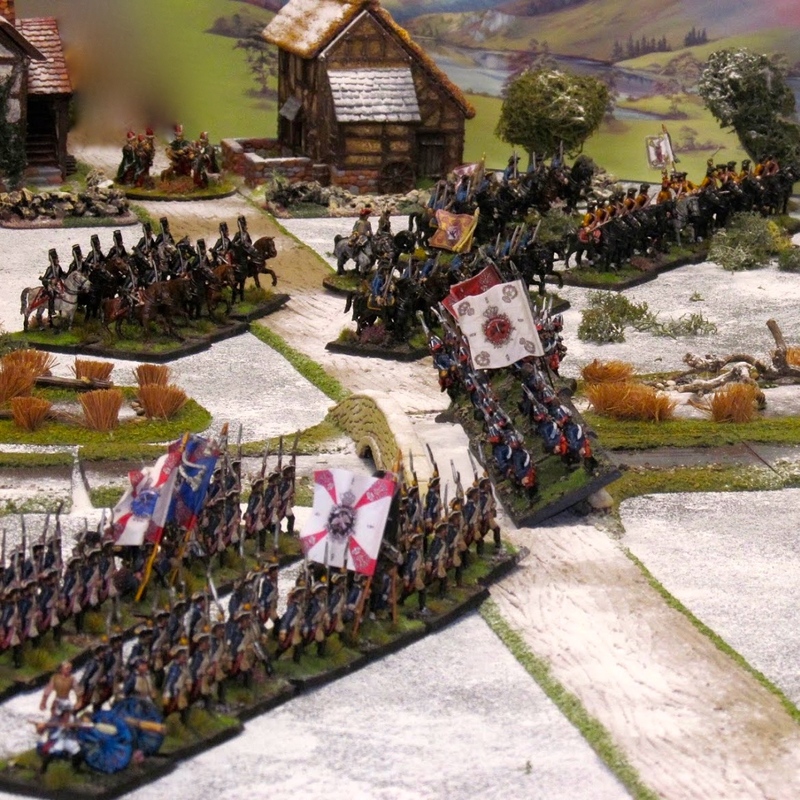 The Prussians were hampered by not knowing when or where their troops would enter the table and by the fact that their blocking force was made up of second class less than enthusiastic troops from the like of Anhalt, Lippe-Detmold, Saxe Coburg and Brunswick. (They were actually standing in for Bavarians but I'd not got them based up fully in time for the game). The Prussians in total had three brigades of infantry and one of cavalry, totalling 15 btns, 2 regts and 8 batteries. Commanders were rated either 8 or 9. 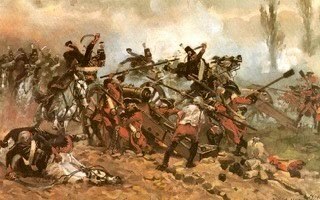 The French had three brigades of infantry, and a brigade of cavalry, 12 btns, 3 regts, 4 batteries and 2 mitrailleuse. Commanders were mainly rated 7 with a couple of 8's Sorry for being so vague but in the tidying up that followed the game I misplaced the orders of battle for both sides. 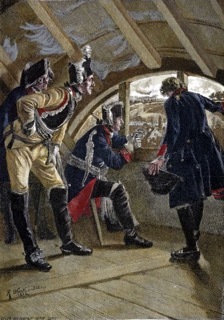 (Above, the French holding the river crossing and the hills in the distance. Below, the other end of the French line, centred around a village. French cavalry can be seen in the far distance). 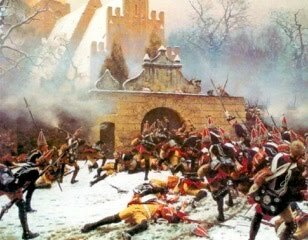 (Above, the Prussians advance in force. Below, the same view from behind the French cavalry brigade). (Above, two battalions of French cross the river while below, the Prussians close with the French holding the hills in the centre). (Above, troopers from Hesse Darmstadt and Hannover advance. Below, the shattered French cavalry are powerless to prevent the Prussian advance). (Above, after their Hessian comrades were beaten off by the deadly chassepot, Hannoverian dragoons charge the disordered and battered French line, forcing them back across the river). (Above, Prussian infantry reach the river while their artillery in the rear bombard the French already across the river and at that time fighting off the Prussian cavalry. Below, the French line facing the Prussian onslaught). (Above and below, the Prussian assault on the French line develops). It seems a long time ago now and my notes have been put away somewhere safe but here is what I think I remember happened. So, cutting a long storey short, the Prussian (allied N German) blocking force managed to keep the French pinned in the village while the main body proceeded to engage the rest of the French who were then unable to extricate themselves from the fight. Two battalions made it across the river but soon found themselves disordered, fired on from the front and rear and charged (unsuccessfully) by cavalry. They ended up being stuck in or just across the river, pinned under artillery fire and threatened by a further cavalry charge. Elsewhere, the Prussian artillery was effective at knocking out their French counterparts and the mitrailleuse batteries, and the French cavalry, i.e. both of my lovely Chasseur a Cheval regiments, was equally effective at dashing itself to ruin in futile charges against the oncoming Prussian infantry, although to be fair they did achieve their objective of forcing back one battalion and holding up the Prussian advance for a couple of moves, long enough perhaps for some of the French to extricate themselves. 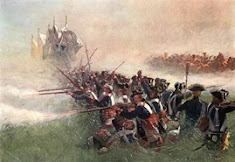 In the end we decided that the French would be unlikely to get away in any significant strength as the blocking force, despite being second rate troops, was just about holding its own, and the rest of the French were likely to be overwhelmed by vastly superior number of Prussian infantry and artillery. Poor command rolls by the French (me) meant that I was unable to take advantage of the first two or three moves before the bulk of the Prussians made their presence felt to galvanise the main body into some sort of order and across the river where superior numbers and firepower would have driven the blocking force away. Anyway, that was the plan, indeed that was the premiss behind the scenario. Again, the amended rules for disorder and break tests, taken from Hail Caesar, worked really well.